Razor Freestyle Scooter, known simply as Freestyle Scooter in Europe, is a scooter game similar to the likes of Tony Hawk's Pro Skater for the Sega Dreamcast. 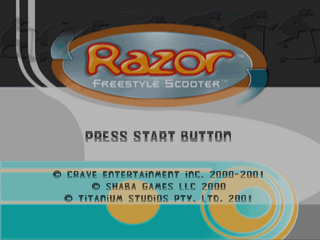 In North America the game was sponsored by Razor, a company which specialises in the manufacturing and sale of scooters. In Razor Freestyle Scooter, your task (as either two children, Chad or Ami, unlocking others as you go) is to rescue your friends captured by a giant robot ("Mad Robot Norton") by completing a series of challenges on a scooter. Most of the game involves obtaining a certain number of points within a strict time limit, though every few stages you are tasked with collecting a specified amount of Razor wheels instead. The game plays similarly to the Tony Hawk's Pro Skater series, but is more simplistic in design and is aimed at a younger audience. Its developers, Shaba Games, would go on to have a role in porting Tony Hawk's Pro Skater 3 and a couple of its sequels to other platforms. Main article: Razor Freestyle Scooter/Magazine articles.